6.42 points at 24 votes (rank 536). The energy creature named Stix is trapped in a cosmic storm and can now be used as an energy source for mankind. With the help of a field synthesizer you need to take away space from the Stix by creating force fields inside the area in which it moves, the hypersquare. But there are four perils that make life difficult for you. If you have not finished a force field and Stix touches a part of it, your field synthesizer will explode. Also, the "quark" and the "anti-quark" are walking the inner border of the energy fields and they destroy the field synthesizer when they touch it. Due to a fault in design (admitted to by the manufacturer) the energy in the synthesizer will build up and make it explode if it stops for too long while building up an energy field. And finally, the synthesizer has only a limited amount of fuel. Simple 2-D view. The bundle of beams consists of several lines that move as a quickly wafting thing in different sizes over the screen. The quarks are shown as slighly thicker dots. The created areas are shown in different colours. 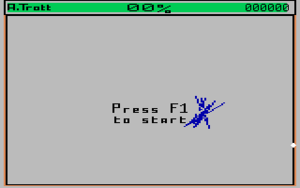 The controls are either done by joystick or the keyboard. To create a new force field, the fire button needs to be pressed at the same time with the movement of the stick. When you keep the fire button pressed during the creation of a force field, the speed will be slowed down, which has the effet, that you can reach a higher score. You will get 20 points per 1% of filled area instead of only 2 points. When you have filled 75% of the area the level is done. When using the keyboard, you control with the keys W , A , S , Z . You get slower with CURSOR up/down , faster with CURSOR left/right . With the key F5 you can restart the current game. After the end of the game the start is done with the key F1 . Time Up --> Game Over! When the time has run out you are finally "Game Over", no matter how many lives you still have. So it can partially make sense to sacrifice a life when you notice that the time has almost run out, because after losing a life, the time bar is full again. One could call this "inconsistent game design". Unfair: When you get caught be the Stix you start again at the place where you started to "draw". If there is currently a quark or an anti-quark, you will sometimes lose another life right after that and you have no chance to avoid this. Even in the Remember version (see Cheats) there was one bug left unfixed. As you can see in the following screenshot, it can happen - even though it happens VERY rarely - that the programme does not separate the area of the Stix from the already coloured areas. Bug: This must not happen, but it does. 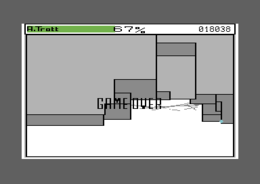 There are several strategies to end a level with the highest possible score and as few lost lives as possible. Example: the less percent of area are left to the Stix at the end, the higher will the points go up. So you can build "traps" to close the Stix in on the smallest possible area. This can be narrow areas that are "fenced off" on two sides, but also spirals. But you have to pay attention to the time. 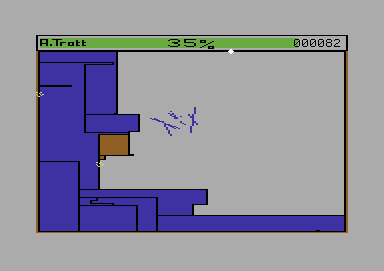 Conventional players would probably half the free area as quickly as possible to end the level as fast as possible. The success of any strategy is always depending on the behaviour of the Stix, which is partially hard to predict. The version by Remember contains next to the manual also the following cheat options: unlimited synthesizers (tries), unlimited energy, no collision with energy particles, no collision with Stix, jump level. Sledgie: "Stix is a very good clone of the arcade classic STYX. For me personally it is great fun. Next to skill also strategic acting is required." Andy027: "In comparison to Qix on the arcade machine the right feeling never came up here, because no images were finished, but only framed areas were filled with colour. The concept is coherent, but they could have made more out of it. After a few hours the game is lying in the corner." Jodigi: "I think this game was one of the first video games that I played... The game is always interesting and a kind of eternal goldie..."
Shakermaker303: "Ah yes, this game also existed. It was quite interesting. It was not simply about closing in, you had to proceed with skill and strategy. Not stupid at all, this game - an ounce of action is worth a ton of theory." Blubarju: "It can be rather nerve-wracking when you are in the process of trying to colour a very big area because of the rising bonus and then Stix (this is what these lines are called, isn't it?? ), which has just made itself comfortable in a corner, suddenly comes towards the player again... The game is again and again fun. 7 points for it." TheRyk: "In whatever version, clone or not, an 8 bit classic. This C64 version is well done and can fascinate for a long time inspite (or because?) 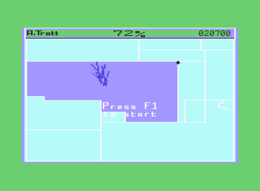 of the incalculable behaviour of Stix, a couple of unfair situations and the somewhat weird rule of running out of time leading to instant game over. 7 points!" 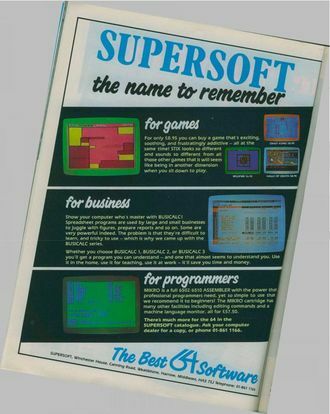 Stix in an advertisement by Supersoft. 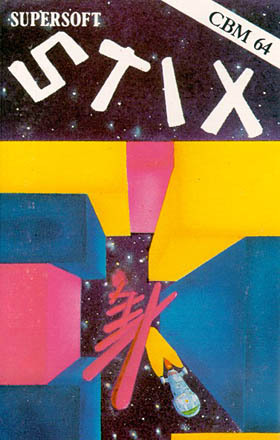 Qix in the Killer List Of Videogames. This page was last modified on 5 June 2016, at 19:43.